Not long ago, my husband and I had a November wedding. We planned our wedding in January, and aimed for only a cozy, intimate wedding with our families and friends who are dear to us. Even though it was a small wedding, the planning was overwhelming. To many, I am considered a lucky bride because my husband, Justin, was involved in every decision making in the planning. For us, the wedding wasn't a "girl's thing", but it was our thing to do together. We decided on things like song list, the band, my bridal wear and shoes, his tuxedo, our flowers, our wedding card designs, you name it. We had no help from wedding planners, but we were lucky to have some relatives who pitched in to make things happen for us on that day. Plus, I also had the chance to do a lot of my wedding decorations and colour coordination by myself too. Moving on, because we didn't have a wedding planner, there were some information that I picked up on my own, and I am just really glad to be able to share it with you. Something old, something new and definitely something borrowed! Here is a DIY bride mini survival guide with tips, ideas and reminders for your wedding planning. Making your own wedding ring box is pretty easy. You don't need skill for this. Just get any small wooden box (I got mine from MR DIY), and think of ways to revamp it into a box that would mean a lot to both of you. To recreate the box that I want, I used acrylic paints and charms for embellishments. For the inside, I used sponge, faux leather fabric and felt to create the place to hold the rings. See this Instagram post caption for a quick DIY tutorial. Getting married isn't just about the wedding; it is about two people coming together as one, hence the saying, 'tie the knot'. When we were designing our wedding invitation cards, we decided to create our first family heirloom, a wedding seal, to pass forward to generations to come. We designed our own wedding seal with Bamboo1619 to go with our wedding invites. The wax seal on the envelope became caught everyone's attention when we hand out the cards. It made them even more excited to open the envelope! Keep it simple when you decorate your wedding dinner venue. You can create a little guestbook corner with markers, stickers and washi tapes. Justin and I didn't sign up for any pre-wedding shoots because we felt that it was unnecessary to spend the money on it. Instead, we compiled our photos over the years and made a photo book of our years together as a couple. We even printed out our favourite photos and framed it up as part of the decor. For your guestbook corner knick-knacks, the best place to shop would be Kaison, Daiso and MR DIY for your budget wedding needs. Instead of giving wedding favors in chocolates or candies, perhaps try making something, but make sure that it is something easy to make. I have to include a disclaimer though, that Tip No.3 is suitable for ONLY small weddings with small number of guests. Because we love lavender and our theme was sort of elegant, rustic; we included handmade miniature bottles of lavender salt scrub that was really easy to make. Everyone was asked to take one home. 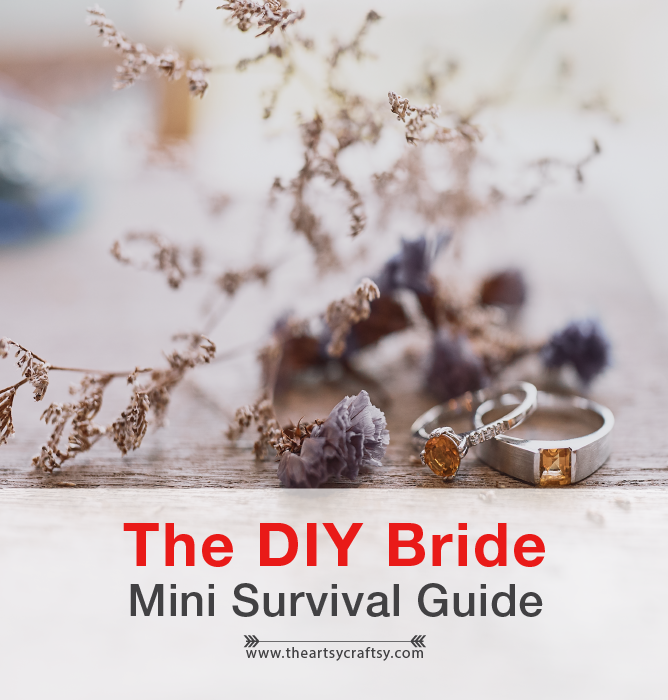 Look out for our DIYbride Workshop! One of the most fun projects! Thank god for faux. We wanted lavender flowers for our centerpieces, and were so happy that we managed to find stalks of faux lavenders that went well with our theme. Plus, it is definitely much cheaper! Again, this is recommended ONLY for small weddings. To make your own wedding centerpieces, you will need to prepare glass jars of assorted shapes and sizes. Use Americana Decor Chalky Finish by DecoArt to paint the jars. You can even design a mini signage with your official wedding hashtag to be attached on the jar as well. Before I decided to make my own boutonnieres, I did a market-survey for pricing, followed by counting the number of family members I would be providing the boutonnieres. When I finally got my total amount and pricing, I was shocked! That's when I decided to make my own, and got more stalks of faux lavenders and other miscellaneous faux plants as well. As for the groom, Justin wanted a more 'edgy' kind of boutonniere and something he can keep too. The materials were all the same, I used mostly felt, jute string, ribbons and small safety pins, except for him, I used faux leather fabric and cord. You can also learn how to make your own wedding boutonnieres, centerpieces and wedding ring box with me. During my dress hunting process, one of my biggest challenge was looking for the perfect dress. What we see in the movies is nothing like it at all. After several hunting rounds, I learned very quickly on what to look out for and how to be prepared for each visit to the bridal houses. Luckily, I started researching and hunting early! Being a person of particular taste and style, I narrowed down the type of dress styles and designs that I like. Pinterest was my go-to! I compiled my designs and started visiting Precious Wedding Boutique Bridal House. Another important tip, remember to bring ONLY people you trust most (in my case, Justin!) because too many opinions can complicate things. A wedding florist is like your hair and make up. It is very important to find one that understands your need and budget, like how The Reserve KL understood how I wanted my decor to fit my colour scheme and style. Can't decide which flowers you want for your decorations? Remember that your wedding flowers don't exactly have to match the rest of your decor. If you want to play it safe, the trick is to choose flowers that matches your colour scheme. As for me, because my colour and style are mostly inspired by rustic, I went for a macrame wall hanger knotted with simple flowers, by The Reserve KL. Why print when you can make your own wedding signage? Recycle wooden boards to make your own signage with your official Instagram hashtag. Look for any wooden boards, size is up to you. Make sure you prep it with white gesso or white acrylic paint, and start lettering on it. Can't write? Don't worry. Get lettering artists like Lefterpenner to write for you! Personally, I get really nervous in front of the camera. I find myself not quite the photogenic type. But for my special day, I learned not to underestimate the beauty of laughter. Brides, loosen up, laugh and the the camera do its job! 14 - Bye Bridezilla, Hello Fun Bride! Before I got married, I heard stories about how fussy and frustrated brides can be on their special day. I didn't understand it at first, until I went through my own planning and I realized that there is reason why brides turn into bridezillas, and not because they are entitled to do so. However, on my special day, the one advice that I cherish the most is letting loose, enjoy and have fun! Whatever happens, there's nothing much we can do about it except going with the flow. No wedding planning is perfect, only let it take its natural course. Remember to have fun, laugh and smile all the time! 15 - Stand Tall and Proud! Special thanks to the brand partners and collaborators who made our wedding possible.